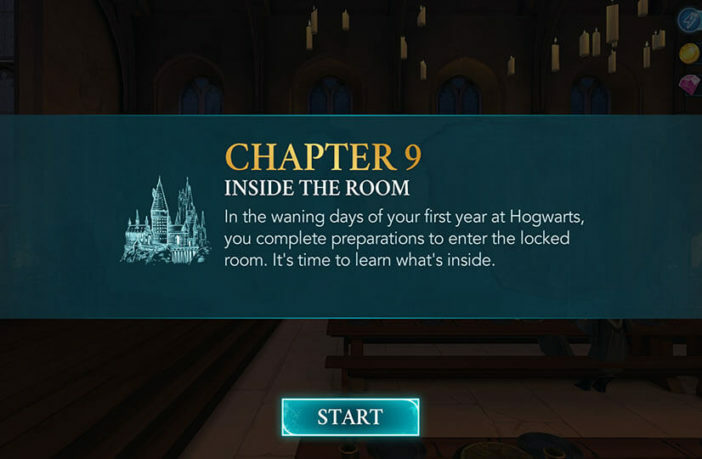 Hello everyone, it’s time for Chapter Nine of Year One of our Magical Journey Walkthrough for Harry Potter: Hogwarts Mystery! 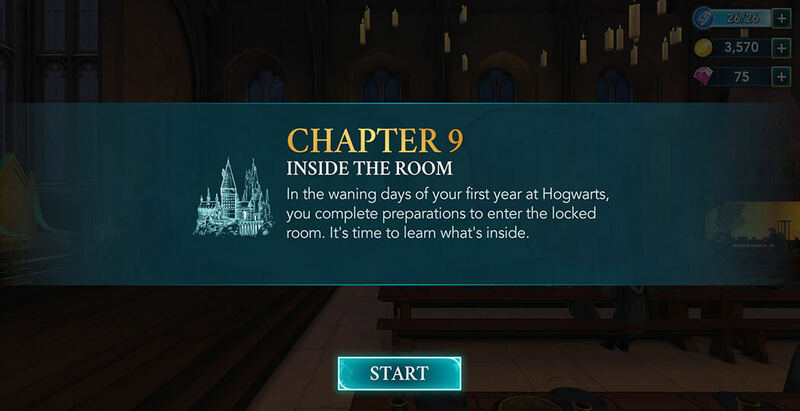 In this Chapter, after all the preparations we will finally get to explore the Mysterious Room in the Forbidden Corridor. We have two of our faithful friends to accompany us to that dangerous venture, and hopefully, with their skills and knowledge, we’ll be able to discover more about the Cursed Vaults! In the last Chapter, we finished all the preparations and soon will be the time to check out that room again. Anyway, let’s get back where we left off last time. To explore the forbidden corridor there is an eight-hour waiting period, so for that and some other reasons it is recommended to clear all the side tasks first. 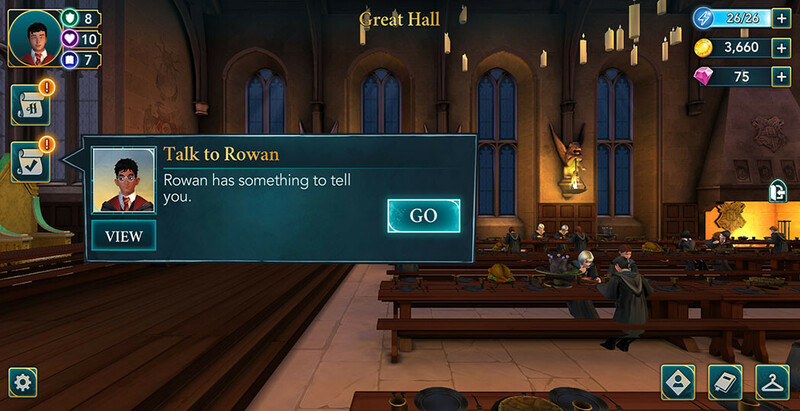 Tap on the GO button and proceed to the Great Hall to meet with Rowan. Once you’re there, he’ll ask why you haven’t been spending more time in your Common Room. You have three ways to respond. Each option will award you with five different attribute points. 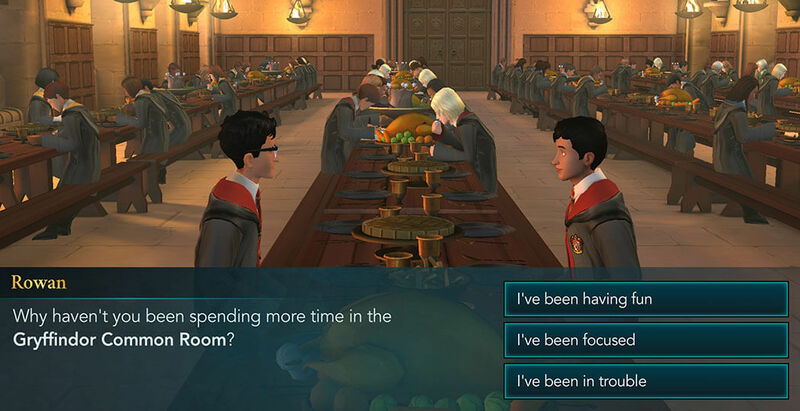 No matter which option you select, you’ll get the task to attend the House Meeting. However, this task also has some waiting time, so the best course of action would be to finish the last flying lesson for this year. Tap on the GO button and proceed to the Training Grounds. 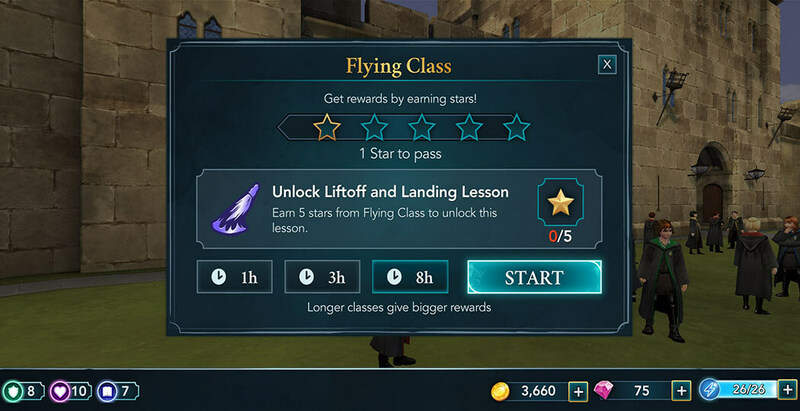 To unlock Liftoff and Landing lesson, you need to gather a total of five stars from the Flying Class. So, the best course of action would be selecting an eight-hour lesson. Do this class in the same manner as any other – complete actions by tapping on the glowing objects in order to fill up the Star Meter and earn Stars. Try to optimize energy usage, and give it your best to succeed at mini-tasks in order to gain some additional Courage points. Once you’re done, it’s time for the Liftoff and Landing lesson. It will require you to earn five stars within three hours, so it is somewhat recommended to start with full energy. Do the same steps as with the flying lesson above and you should have no problem completing it. When you earn your fifth Star, it’s time to lift off. 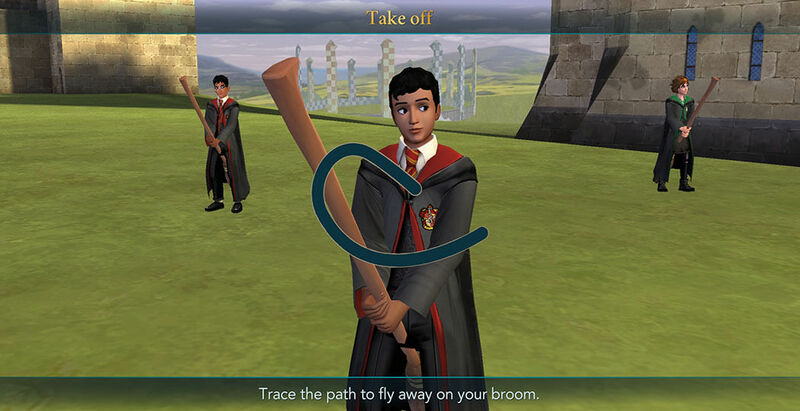 Trace the path on the screen in order to start flying. Congratulation! By doing this, you completed all of the lessons for Year One of our Hogwarts studies. This will also raise your maximum energy by one, so it is a nice addition for future tasks. 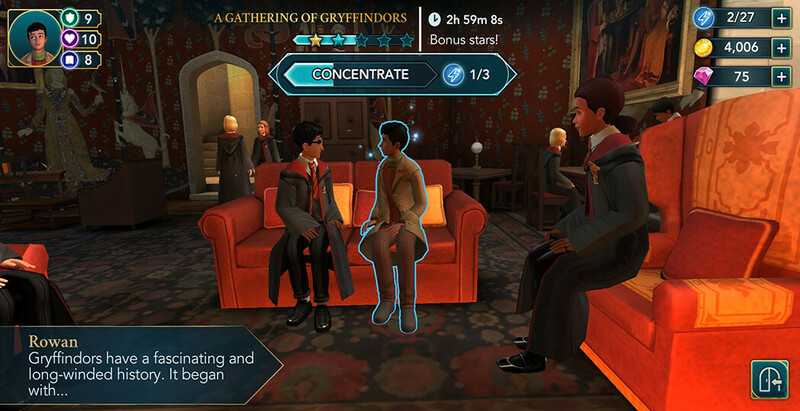 While you were doing this lesson, the waiting timer for your House meeting should have ended, so you can proceed to your Common Room to attend it. 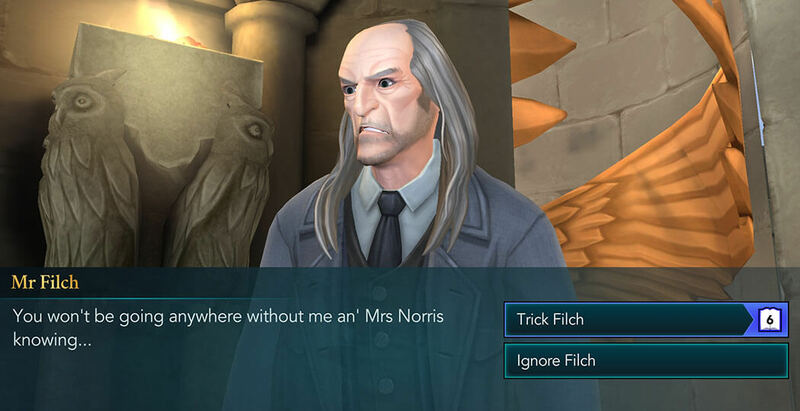 On the way there you’ll encounter the caretaker – Mr. Filch. He’s the only obstacle you haven’t dealt with yet. After a bit of talking, you can choose to trick him or ignore him. Tricking him requires level six in Knowledge attribute, and is the recommended option since it will reward you with ten attribute points. After a bit of talking, he’ll leave, so you’ll be able to proceed to your Common Room. When you get there, you’ll be greeted by your Prefect, Rowan, and one other character, depending on the House you got sorted in. For your gathering, you need to earn five stars within three hours, but you only need one star to pass. If you want to earn some bonus rewards, it is recommended to start with full energy. 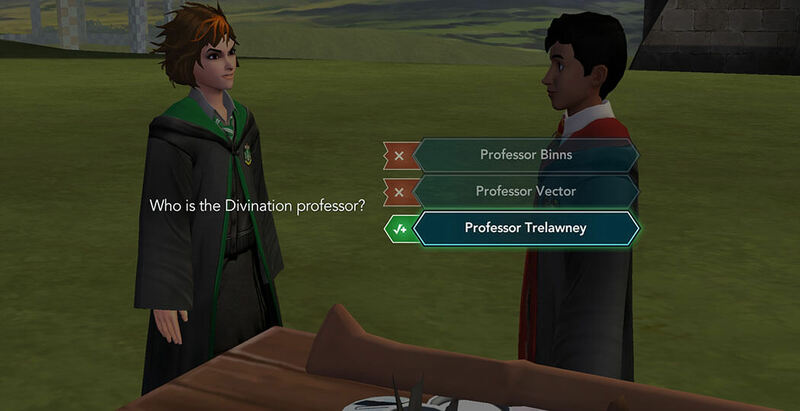 After you’re done, your Prefect will ask for your opinion. You have two options to respond with. 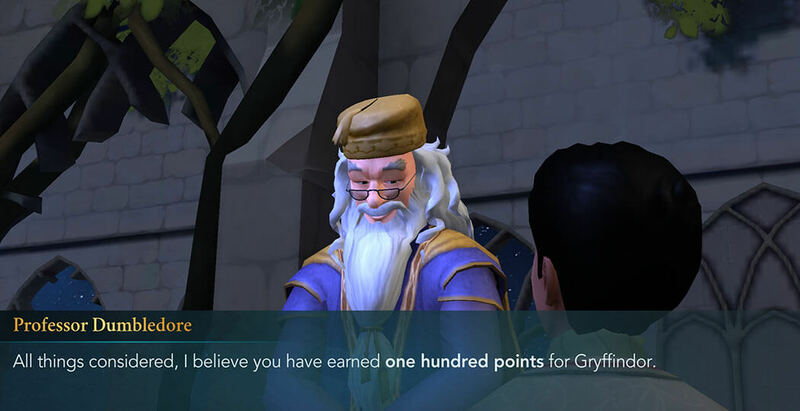 This option differs a bit, depending on which House you are in, but in general, the first option will require you to have level seven in an attribute, and that one is recommended since it rewards ten attribute points. After a bit more talking, this quest will be completed and you’ll receive some nice rewards for your effort. Now that you’re done with all the lessons and side-quests, it’s time for the main event – entering the Mysterious Room. Tap on the GO button and proceed to the Upstairs Corridor. Rowan, yourself, and either Ben or Penny (depending on which one you chose for this adventure) will gather and discuss the plan. 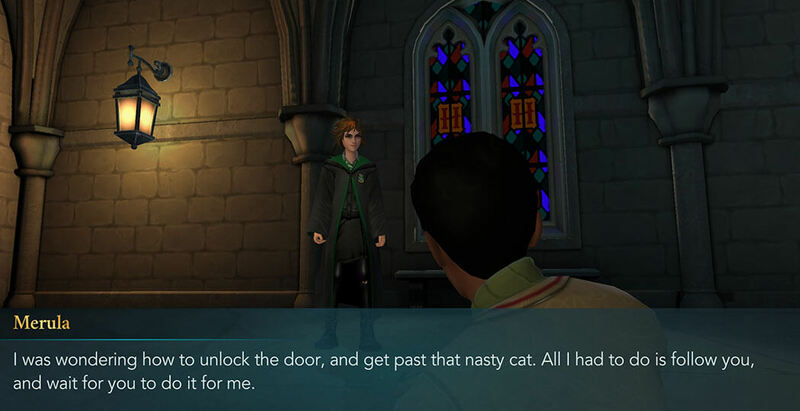 In general, Ben or Penny will stay to keep guard, Rowan will be tasked with giving Mrs. Norris the Sleeping Draught, while your job will be to unlock the door with Alohomora. Thankfully, the potion works and Mrs. Norris is put soundly to sleep. 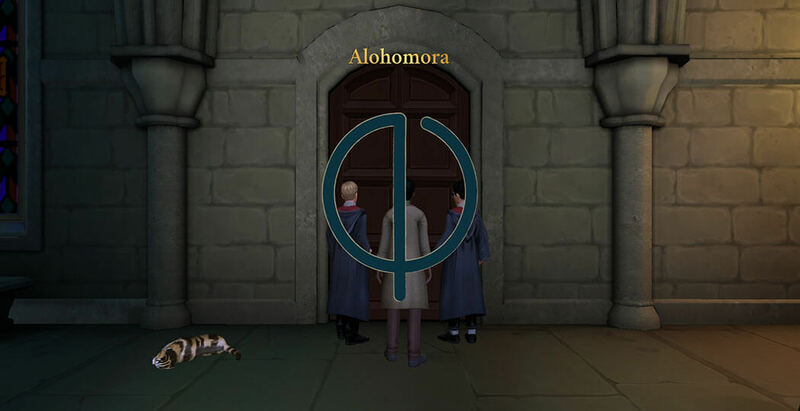 The next step is to use Alohomora on the door. Trace the path on the screen to successfully cast the Unlocking Charm. 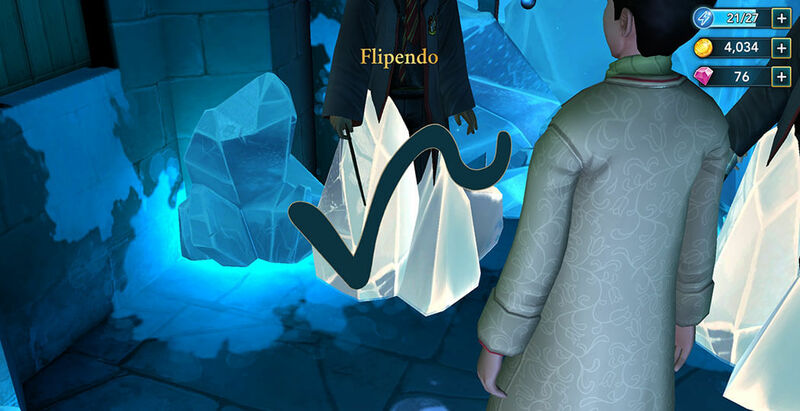 The spell will work and the door will unlock, but suddenly you’ll get ambushed by Merula and she’ll knock you and your friends on the ground using Flipendo Charm. Apparently, she is obsessed with finding the Cursed Vaults, and she waited for this opportunity to explore the Mysterious Room before you do. After getting up and making sure everyone is all right, you have three options – you can choose to stop her, make her pay or help her in case she’s in trouble. 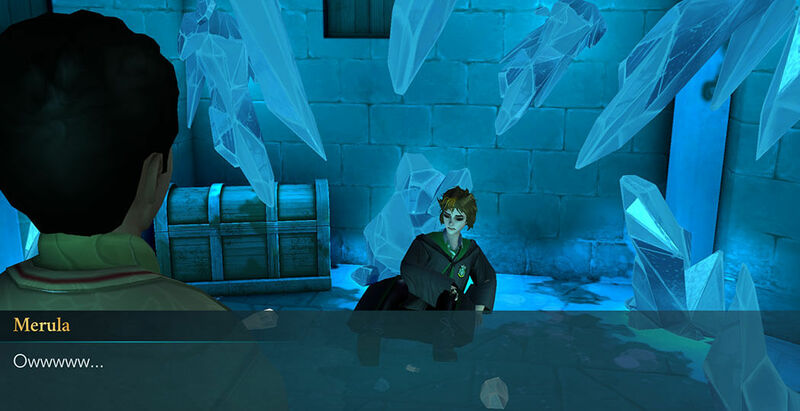 Regardless of the option, you select, three of you will decide to enter the room and follow Merula. This will open a task which requires you to earn five stars within one hour. It is very important to have full energy when starting this! Once you’re ready, hit the start button to proceed. 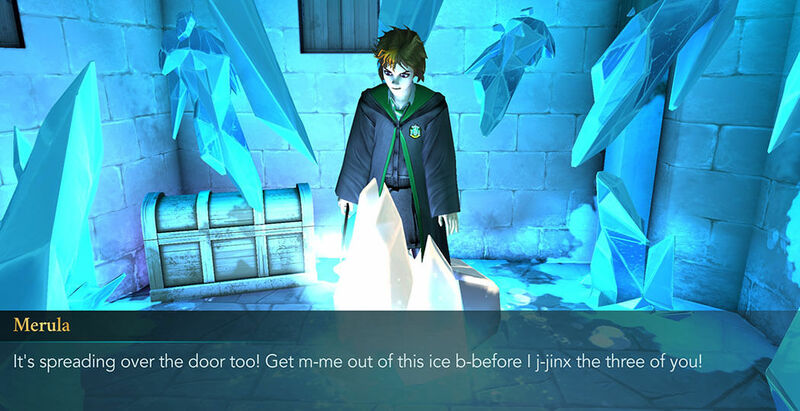 Upon entering, you’ll notice that Merula got frozen by the cursed ice. Immediately after, the door gets encased in ice and two of your friends will also get frozen. 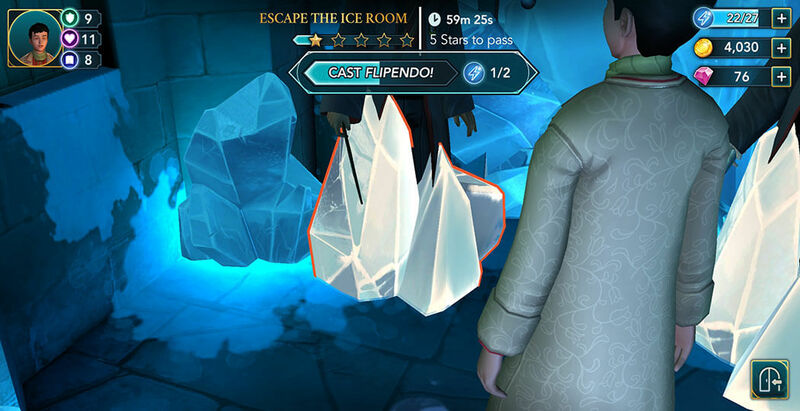 You need to complete actions by tapping on the ice and then casting a Flipendo charm to break the ice away and release your friends. Do the same actions for both of your friends and you’ll set them free. 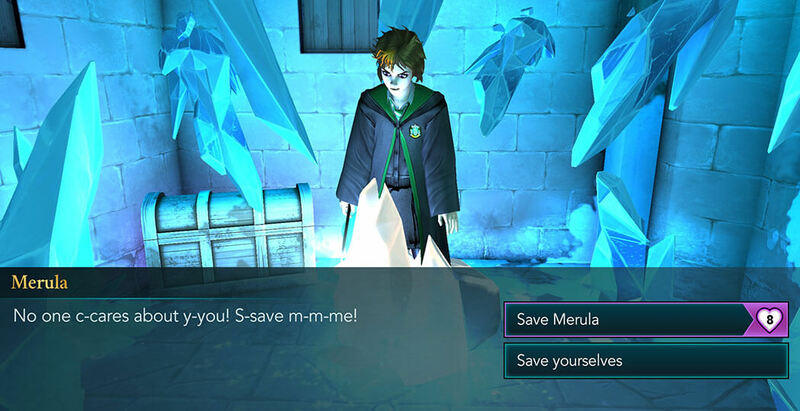 Next, you get to choose if you want to save Merula or not. Saving her requires Empathy level eight, but it is the preferred option since it rewards ten attribute points. Even if you hate her so much and decide against saving her, one of your friends will do so, regardless, so it is preferable taking the option which gives you better rewards. Repeat the same process on her in order to set her free. After casting Flipendo, she’ll finally get a taste of her own medicine, maybe not in a way you hoped for, but satisfying none the less. Afterward, you’ll ask the friend you brought along for help opening the door. 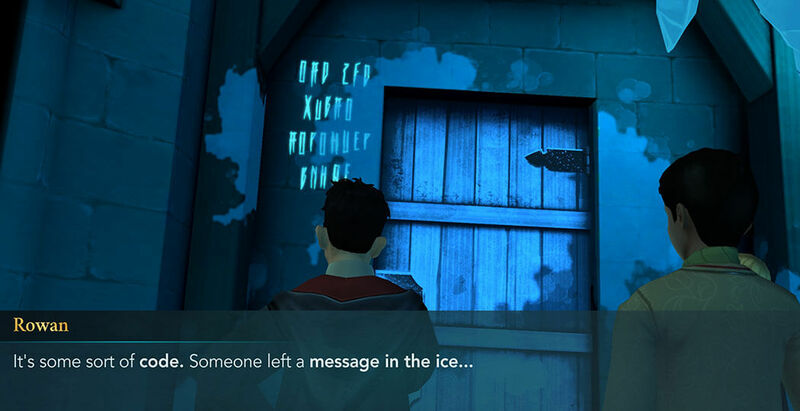 In case you brought Ben, he will use Flipendo Charm to break the ice around the door, but if you went with Penny, she’ll use the strengthening solution to smash the ice. You’ll then notice the strange writing on the wall near the door. 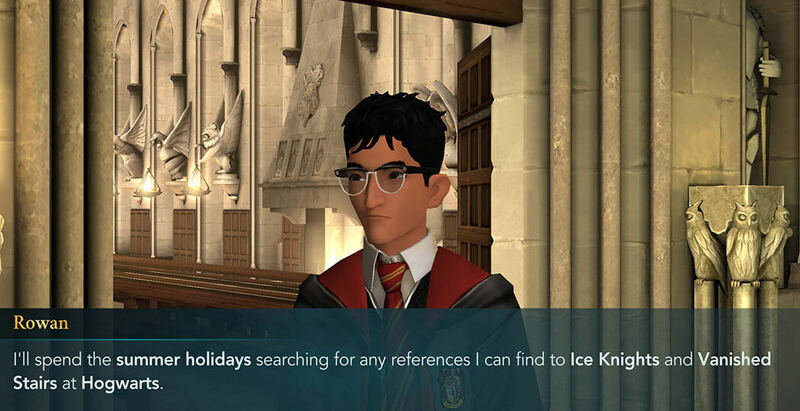 Rowan will memorize it and you’ll decide to leave before the cursed ice reappears. 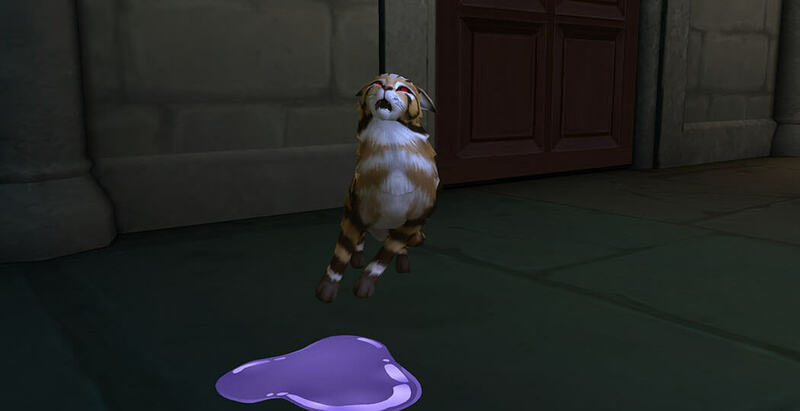 Upon leaving, Merula will go back to her old self and Rowan and you will decide it’s for the best that you go back to your Common Room. This will open up a new task to report to your House Prefect. Tap on the GO button and proceed to the Great Hall. When you get there, you’ll be able to tap on the speech bubbles above some of the other students to see what they have to say. Then, tap on the exclamation mark to start the conversation with your Prefect. 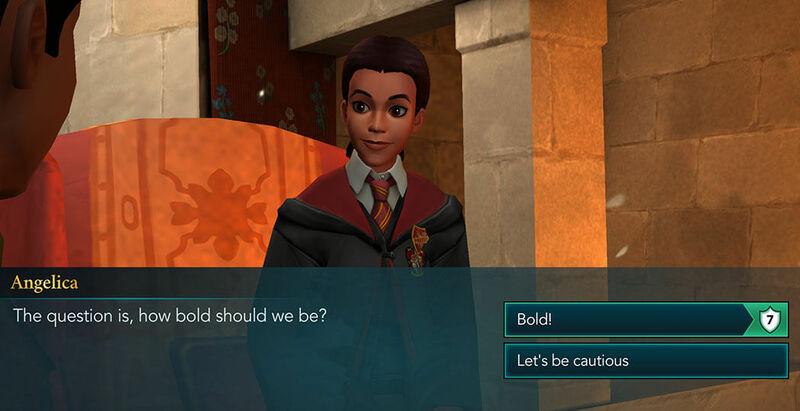 She’ll warn you that word travels fast in Hogwarts, and will ask if you and your friend went to the Forbidden Corridor. You can choose if you want to tell the truth or not. 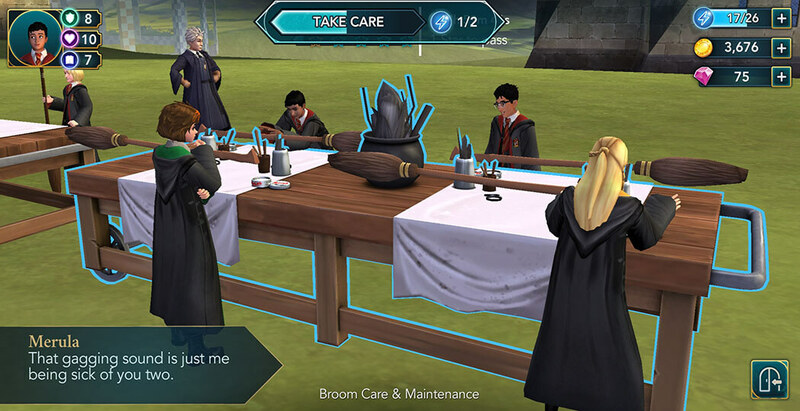 If you want to lie to your Prefect and cover for your friends, it will require level eight Empathy but will reward you with ten attribute points. Admitting the truth will award you with five knowledge points. In any case, she will let you know that Professor Dumbledore requested your presence. This will be your next task. However, there is an eight-hour waiting period before you’re able to continue, so you can either wait or spend some gems to instantly proceed. Either way, when you are ready, hit the GO button and proceed to the courtyard. On the way there, you’ll encounter Rowan, who will say that he transcribed the message you found in the Mysterious Room. After a bit of talking, he’ll promise to spend his summer holidays trying to find more information about it, and he’ll also wish you the best of luck in your meeting with the Headmaster. When you get to the courtyard, you’ll notice that Dumbledore is already waiting for you there. Tap on the exclamation mark to start the conversation. After a bit of talking, he’ll give you an opportunity to ask him something. You can ask him about three different things. 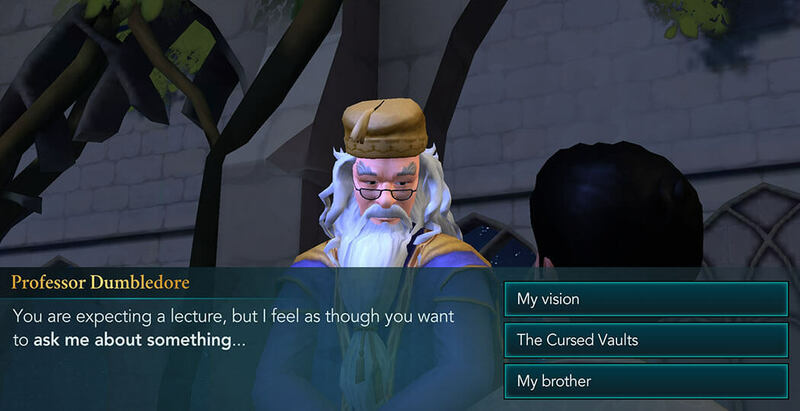 Each option will award you five points in a different attribute, but no matter what you choose, he’ll tell you that things will become clearer in the following years at Hogwarts. 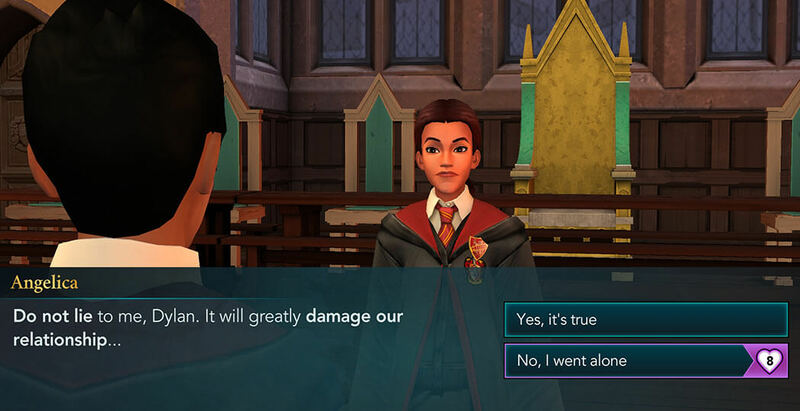 After a bit more talking, you find out not only that you won’t get expelled, but that he’ll also reward you with one hundred House Points! And this is the end of Chapter Nine of our Magical Journey. What was your favorite part? What options did you choose? Who did you bring to the Mysterious Room? Did you tell the truth to your Prefect? Let us know in the comments. Thank you for reading and see you soon with the conclusion to Year One of our adventure!